Not having blogged for a while, this post includes a somewhat random collection of subjects. There will be short stories and more paintings again next time. 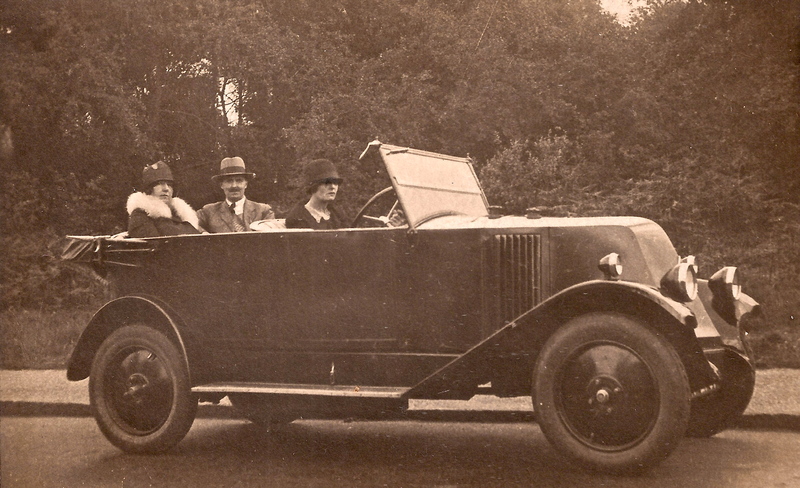 First, can anyone identify the make of this English car of the 1920s? Next, while I blush at the years that have passed before I got around to reading Middlemarch (George Eliot), I finally accomplished this. If I had read it as a schoolgirl, I might have been a better writer, but hopefully it is never too late to have an improving influence. Eliot has a way of lightly skewering a character onto the page, with the result that they are forever real in your mind. There are no saints or villains to be seen; every character has strengths and weaknesses, can fascinate or disgust. A few words on Mr and Mr’s Vincy’s relationship with their daughter, Rosamund, tells so much about all their characters. Rosamund… listened in silence, and at the end gave a certain graceful turn of the neck, of which only long experience could teach you that it meant perfect obstinacy. And Bulstrode’s endless rationalisations are a total giveaway of sanctimonious hypocrisy. … is it not one thing to set up a new gin-palace and another to accept an investment in an old one? The fates treat everyone with impartial kindness or cruelty according to random whim. Yet the plot is tight, intricate, totally believable and immensely satisfying. This is exactly what the title implies, a novel woven round a community, and yet this is no old-fashioned pastoral, the individual stories still grab you today. People’s mistakes and aspirations are still recognisable today. I’d better stop. Basically, Eliot has all the skills I am striving to acquire and my envy of her is too blatant. I started Middlemarch in high summer, but autumn has more than set in. The hedgehogs are still feeding; we almost tripped over one last night, snuffling just outside the back door. He scuttled off, but returned quickly when I put food out. They will not eat in the rain, so if it is wet we put the plate under the back porch. Finally, my favourite rose, Just Joey, has decided to have a final summer fling and the cosmos chocamocha is flowering madly. This entry was posted in Gardens, Reading, Uncategorized, Writing notes and tagged 1920s car, character writing, chocolate cosmos, cosmos chocamocha, George Eliot, hedgehogs, literature, Middlemarch, Mr Vincy, Rosa Just Joey, Rosamund Vincy, vintage car by hilarycustancegreen. Bookmark the permalink. Yes, I’m a sucker for these creatures, but I think it’s a losing battle; I’m not sure any great grandchildren we might have will get to see them. Thanks, I love the in-between salmon to pink colours. “Middlemarch” has been on my TBR pile since listening to a lovely interview a year or so ago by the author of “My Life In Middlemarch.” I wonder if you know it? Her love of the book is so contagious that I knew I’d want to read it in the near future. And here it is a few years later….your review reminds me to get on the literary ball. I will look this up, thanks. Hope you get to it sometime. I have read Middlemarch but except for the title have forgotten it’s main contents. Your little snippets brought some of it back. Great rose and lovely colour. I could have put in a hundred snippets, she really brings people to life. Wow. Anyone who can read Victoria literature is a hero in my books. I read Thomas Hardy in university and I’m afraid I’ve never gone back. Your review does make it tempting, though. 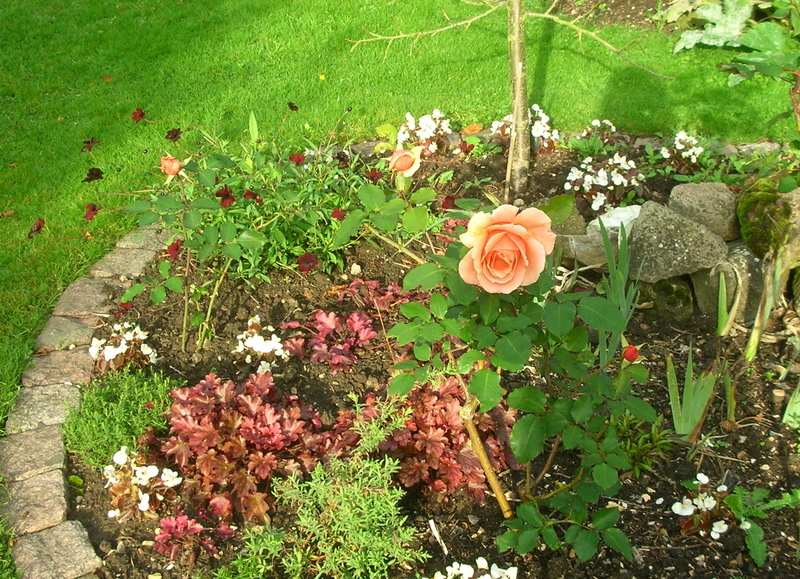 Gosh, your garden looks awfully good for October 18th! Ugh. My keyboard keys stick. “VictoriaN literature”. Good thing this is the 21st century or my knuckles would be rapped for bad spelling! I can’t cope with Hardy at all… Eliot is very different. We are having an exceptionally mild autumn here. Your shot of that car is, I am firmly of the belief, the sole one on the web ! – I have found nothing even remotely like it, alas, and I have search exhaustively. My husband was given the photo because I foolishly said that he would identify it. Like you, we have come up blank. Someone must know. Hedgehogs are committed to night-time foraging and my camera won’t play. I’ll keep trying. Don’t recognise the car. I read Middlemarch many years ago and don’t remember much of it, apart from a character called Casaubon who had undertaken a Major Project he was never going to finish. Something to do with the worlds religions, as I recall. We don’t want to kid ourselves like him. You have remembered well; Casaubon and his undertaking are a true academic’s nightmare. You do meet such people, though – a real warning. Me too, a latecomer to most of the classics (and I don’t like many that much), but I will read more Eliot. Sadly no hedgehogs in Middlemarch. By the wonders of ibooks, I was actually able to check in the text! If you happen to know any car experts float this picture past them; it has us baffled. Will do. I do know a car buff so I will ask. I downloaded Middlemarch from the Gutenberg project although I suspect I may have a very old (inherited) book club edition in store somewhere. I **adore** Middlemarch, and am always so happy to hear from others who do, too! I love Mary Garth, and Dorothea Brooke, and the Lydgate/Vincy plot line becomes more heart-wrenching every time I read it. You can never read Middlemarch too many times! Hooray, I love them too. I wanted to put all these people into the post, but it would have gone on forever. I cannot bear Lydgate’s fate either. Hilary, I don’t recognize the car either, but if I can lay my hands on a copy of a book about antique British saloons that I think we have somewhere in our library (possibly storage), I’d be happy to look it up. That angular front … hmm. I haven’t read Middlemarch, but I recall thinking George Eliot was talented when I read Adam Bede in early college. I probably need to re-read that, as well as take up Middlemarch. Your short review is intriguing! The car remains a mystery, I agree the front is strangely angular. I, to my shame, had previously read no Eliot, I’m so glad I got there in the end. Probably a 1925 Renault NN Torpedo (courtesy of Geoff Procter). Brilliant! My husband had muttered about it probably being a Renault, so he is happy. He has no found a pic of the very one, so we will be able to tell the owner of the photo (who was looking through family photos after a death in the family), so he will be pleased! Thank you so much. I was going to say the car was not English but see you got an answer toute suite! The wonderful blogging community (Andrew’s friend) came to our rescue très vite.